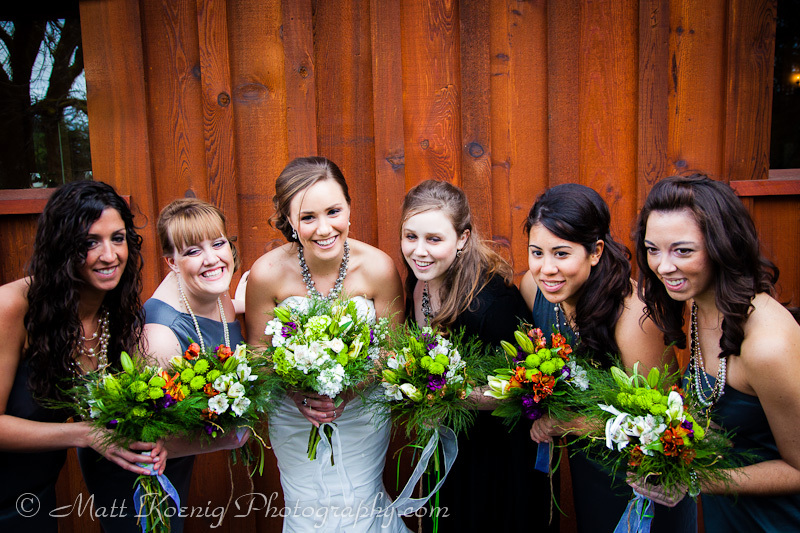 Last weekend I had the honor and privilege to shoot a wedding with my friend Renee of Renascent Photography. Kyle and Lizzy are friends so I was excited to be able to capture some of the special memories and moments of their day. I’ll be honest, shooting weddings is a real challenge for me. This isn’t the first wedding I have shot so I’ve noticed a definite pattern in my anticipatory thinking as the day approaches. I start out excited, slip into a state of nervousness followed by self-doubt and eventually rise to the occasion and have a ton of fun. This wedding was no exception and it did offer up some new challenges. 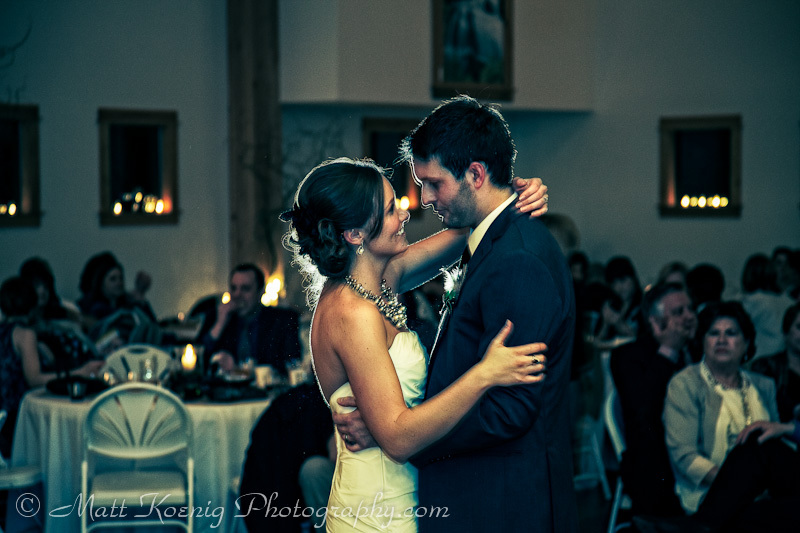 The event took place at Deep Woods a wedding and event center located in Elmira Oregon. They had actually just completed a beautiful event building that was just stunning with soaring ceilings and giant wood beams and a polished concrete floor. They really did an incredible job. 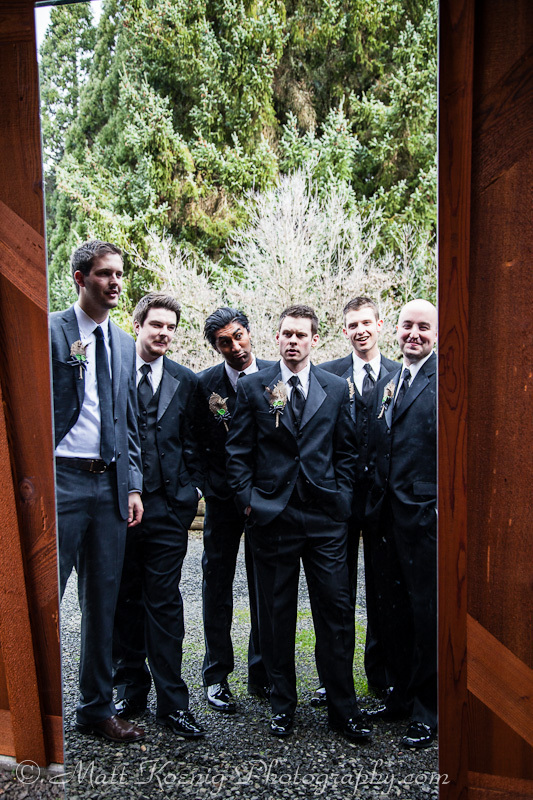 The groom and groomsmen arrived and setup shop in the grooms room which was a small space but outfitted with a bar and pool table and decorated with manly beer slogan mirrors and neon signs. It was a great space that offered up lots of photo opportunities. 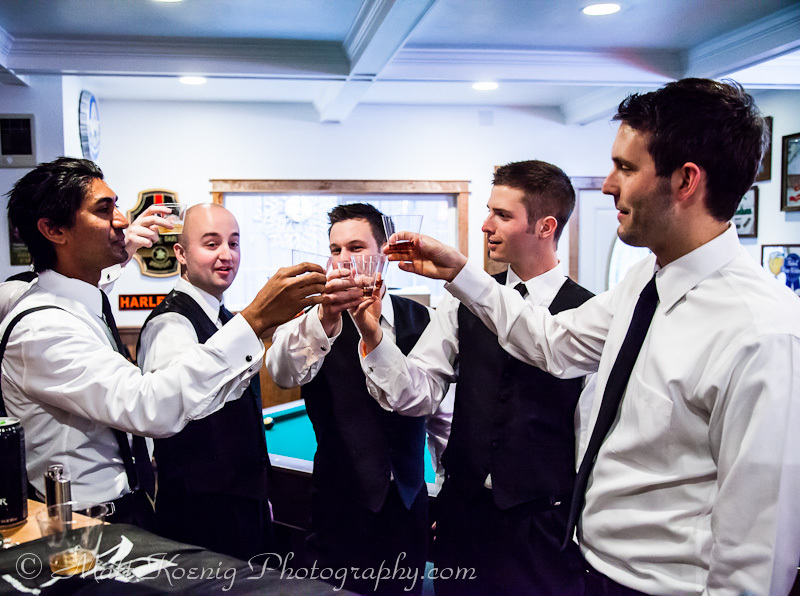 Of course my first thought after seeing the pool table was having the groom shooting pool with his groomsmen all around him watching the shot. 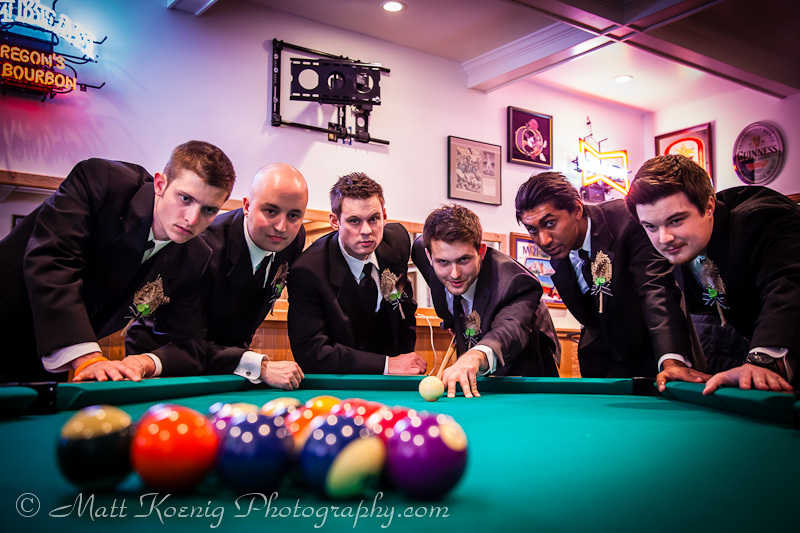 We racked the pool balls and had the groom pose in a shooting position like he was going to break while his groomsmen leaned over on each side looking at the table. I got down really low and took this shot. I tried to take photos that captured the jovial and light atmosphere of everyone getting ready. These guys were just a blast to work with and they really made taking photos fun. 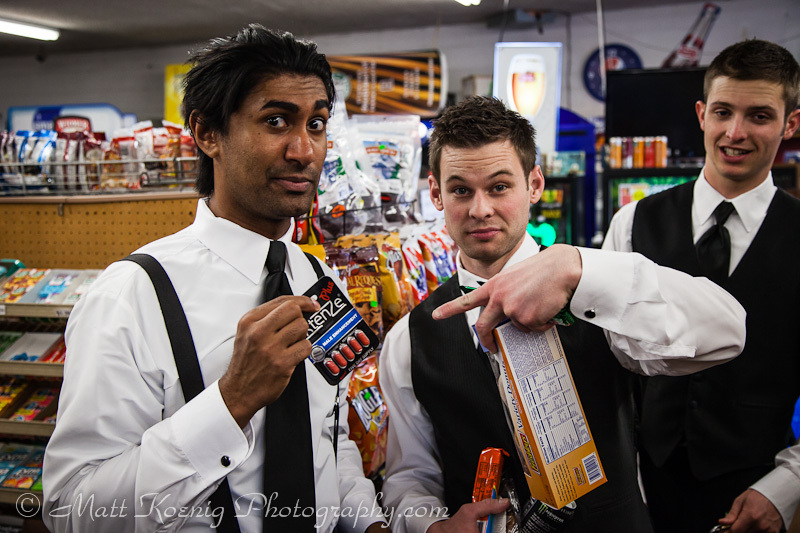 At one point I took a ride to a small store with a few of the groomsmen where we had some fun taking shots of them buying different items like nasty cheap beer, energy drinks and eventually some “male enhancement” pills for the groom’s big night. Hilarious!! 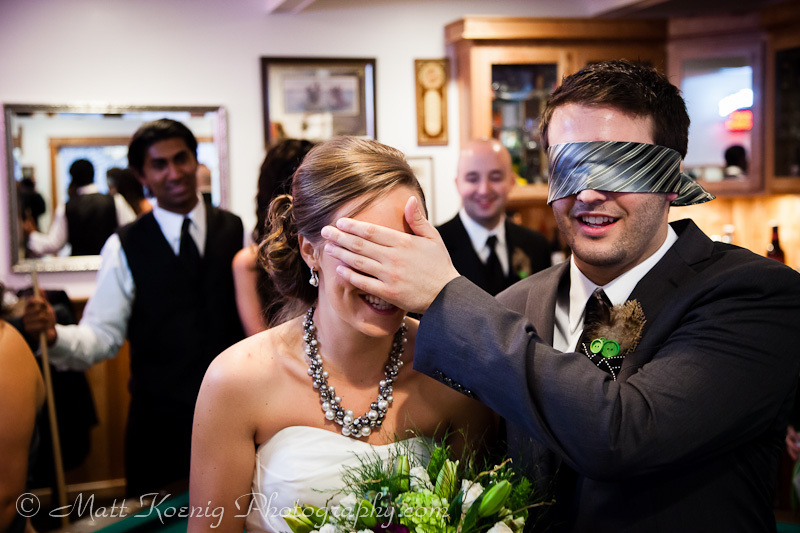 Kyle and Lizzy had decided beforehand that Kyle wouldn’t see his bride before the ceremony so we decided to have some fun with blindfolding him and taking a few photos. I can’t say I’ve had this much fun shooting a wedding. The weather forecast had called for rain showers but thankfully they held off and we were able to get out and do some outdoor shooting of the bridal party. We shot the groom and groomsmen separately from the bride and bridesmaids so that the groom wouldn’t see his bride before the ceremony so we had to do some shuffling of locations to make sure we honored that decision. We shot at several locations around the event center but I really liked the image made in this full length mirror that was just leaning against a wall. At one point we had gone down to take a few shots along a road. As the bride was walking back I took what is my favorite shot of the whole day. The weather forecast had been rain but the sky had opened up for a bit and created this cool broken sky pattern. 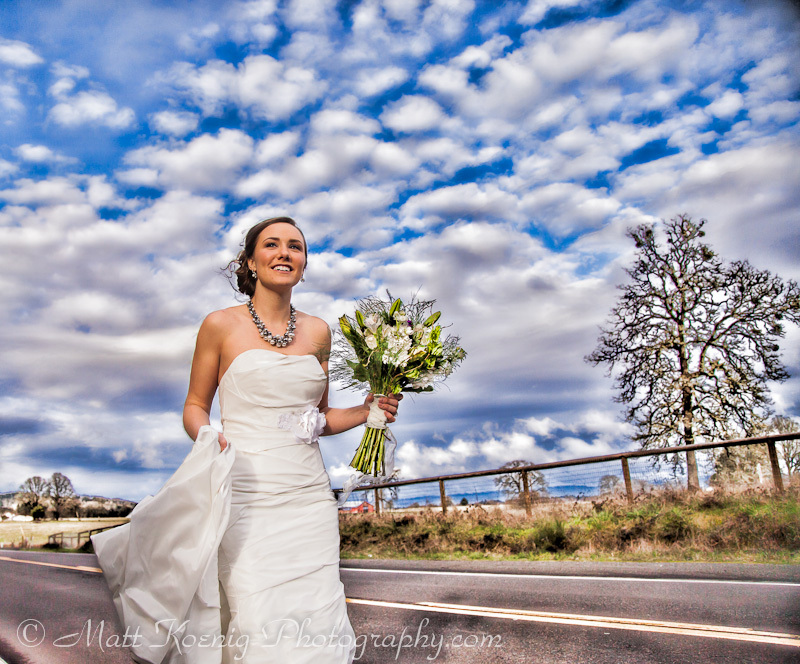 I had got down low and was shooting up toward the bride to capture this sky as the background. I really love this image. As we were preparing for the ceremony and getting into position we grew concerned about the lighting inside. We had been told that the lights would remain at a level we were happy with but as the ceremony started they were brought down and made for some really tough shooting conditions. I had decided to use my Canon 7D coupled with the Canon 70-200 f/2.8L IS II which performs well in low light conditions and I wanted that extra reach with the crop sensor camera. But the low lighting proved to be very problematic and I had to shoot at ISO 6400 most of the time which isn’t all that pretty on the 7D. I was very challenged by this and ended up with shots that had too slow a shutter speed particularly when zoomed in to 200mm where slight movements are more noticeable. Even with IS turned on I had a lot of blurred images. At first I shot in Av mode but then switched to manual and adjusted to what I felt was the best I could do for the lighting situation. I ended up shooting wide open (f/2.8) between 1/60th and 1/100th sec at ISO 6400. But as with any difficult and challenging situation I like to look at it as a learning experience. In this case I learned that I would have liked to have had a faster lens. My 50mm 1.8 would have possibly done better but I would have had to be more intrusive in the ceremony and at 6’2″ it would be hard to ignore me. After the ceremony the party really got started. The first dance was great and I was able to use flash at this point. I had on a Canon 580EXII coupled with a faux Gary Fong Lightsphere that I had picked up on eBay from Hong Kong for a fraction of the cost. This was the first time I really used it and I really noticed a difference when compared with bare flash. I did get a couple of comments asking if the cup on top of my flash was for tips. Unfortunately for this first dance shot I was in manual mode and shooting at a very slow shutter speed (1/6th sec) so even with flash I got some blur in the image. But I still really like this shot. My shooting partner Renee was on the other side behind the newlyweds and her flash fired creating this cool rim light that really sets the couple apart from the background. I just love the way they are looking at each other. One of my favorite shots of the night despite some technical flaws. Toward the end of the night there was the garter and bouquet toss followed with lots of dancing. 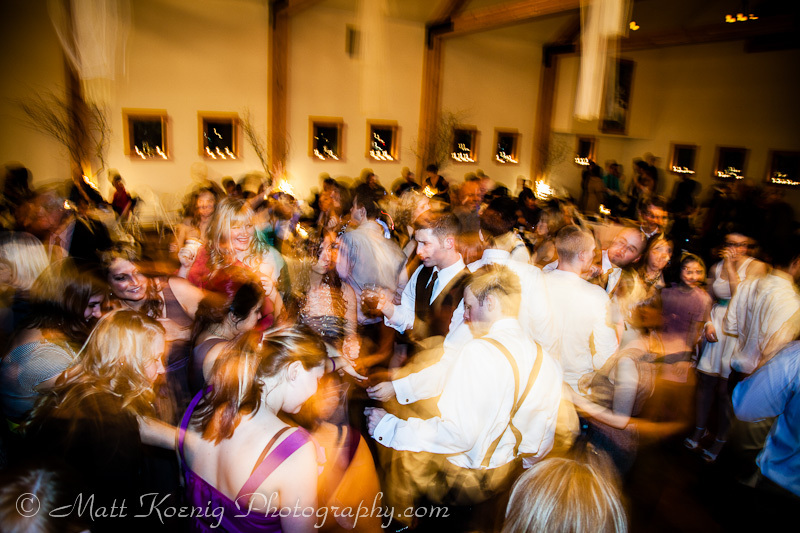 I really wanted to capture the high energy on the dance floor so I used flash but set my shutter speed to a low number and set the flash to fire on second curtain. I think this image really speaks to the high energy and fun everyone was having. It was a long day and I was certainly tired at the end but it was so much fun and I have to thank my friend Renee for inviting me to shoot with her. We’ve shot several weddings now and each one has been a ton of fun. I look forward to working with her more in the future. Finally, a big congratulation to Kyle & Lizzy for sharing this beautiful day in their life with us.